Last year, one of my celebratory posts was on books based on/inspired by the Nigerian Civil War, where I showcased novels such as Elechi Amadi's Sunset in Biafra (1973), Chukuemeka Ike’s Sunset at Dawn (1976), and Flora Nwapa’s Never Again (1976). I was initially going to write a different post, but then I stumbled on an article written in 1991 by Graham Furniss on Hausa Poetry on the Nigerian Civil War. 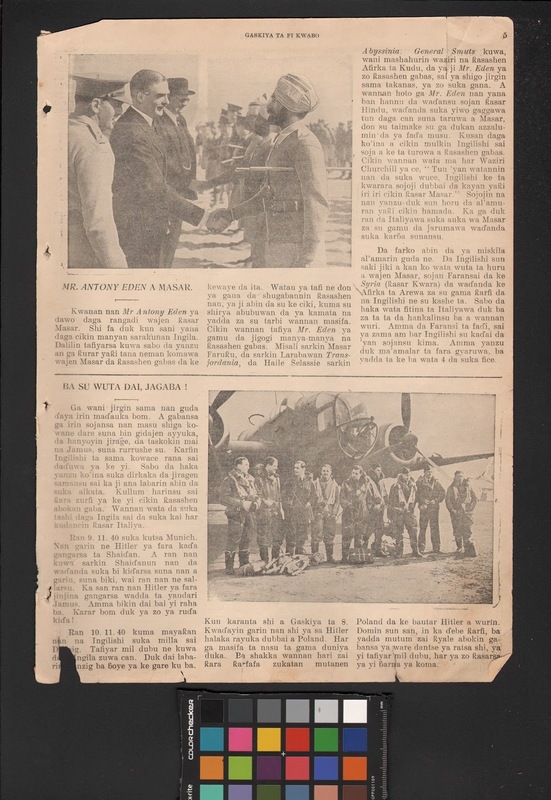 After reading it, I decided to share some excerpts from the article (yes, my nerdy academic side could not resist) which gives insights into the ways in which Hausa poets wrote about the military leaders of both sides of the war. Hope you enjoy!!! "In Hausa, there has been little written recently looking back to that period [Nigerian Civil War]. Nevertheless, there was a considerable body of material in verse produced during the war years (1967-70) and published in the main Hausa language newspaper, Gaskiya ta Fi kwabo, or recited at gatherings and over the radio." (Furniss, 1991:21). 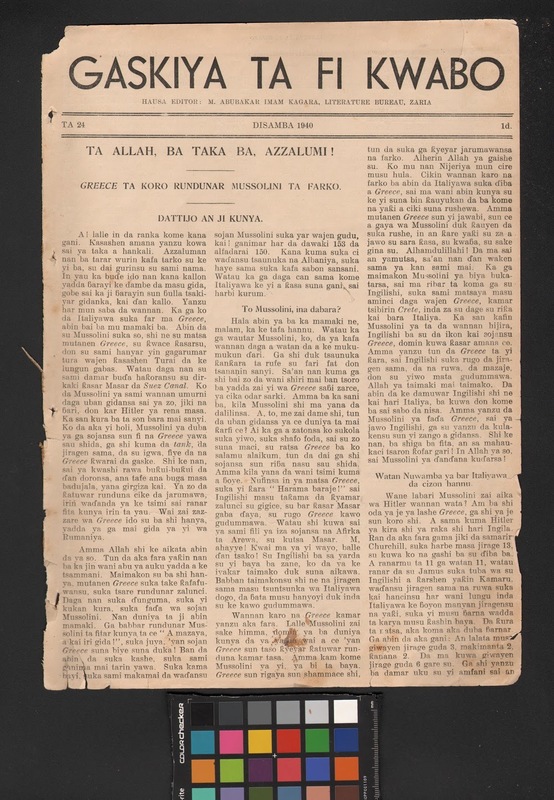 Gaskiya Ta Fi Kwabo (The truth is worth more than a Kwabo [Kobo - Nigerian currency]) is a Hausa-language newspaper in northern Nigeria and the first newspaper published entirely in Hausa. 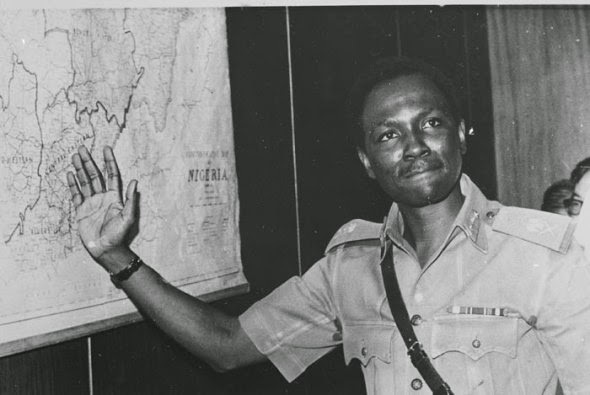 make this song for you, Major Yakubu Gowon, great one, leader of soldiers. The world recognises you, your zeal and your honesty. You have no fear, only respect for others. If any man opposes you or acts shamelessly, compel him to return to the road, commander of the host of soldiers. and now today I shall include it in this account of the soldiers. give me the form to sign, Muhammadu Shuwa, who holds the reins of the soldiers. you who set brave men to work to cook - not tuwo but soldiers' cannon. Major Yakubu Dan Juma, tenfold greetings! it is you who subjugate the shameless one, the one who has deviated far from the right way. Toss him and catch him like a stone in carabke. Give him your sort of cola-nuts, that he has asked for! And since he has provoked you, do your duty by him. Don't ket Ojukwu get away with it, soldiers. and your soothsayers are both given the lie. Brave men are after you and they will catch you, the soldiers. You black, rebel scum! Offspring a village girl. playing the ostrich before the eyes of our soldiers. syllable - up comes a soldier! and increase the intensity of your screaming. Has some calamity come upon you? Yes you've met the range of the soldiers. Wherever you are, inside or outside, slow down and go and seek peace from the soldiers.
" ... a number of poems present a chronology of events leading up to the outbreak of hostilities and an outline of the progress of the war at the time of writing. For example, Faduwar Enugu (The Fall of Enugu) dated 5/10/67 by Mudi Spikin; Tarihin Yakin Nijeriya farkon somawa daga 27/5/67 zuwa 7/10/67 (The history of the Nigerian War from its inception on 27/5/67 to 7/10/67) again by Mudi Spikin, in which the author sets out his understanding of the sequence of events leading up to the secession ... The poem goes in detail through the progress of advances and retreats, ground and air attacks and the disposition of the Federal forces and their senior officers. In Bearing Witness: Readers, Writers and the Novel in Nigeria, Wendy Griswold estimated that three quarters of Biafran novels are by Igbo authors (some exceptions she mentioned includes Wole Soyinka's Season of Anomy, Ken Saro-Wiwa's Sozaboy and Elechi Amadi's Estrangement). So it's really interesting to get this small glimpse into the writings of Hausa poets during this period of Nigeria's history. This source would be a great store of tips and articles for all kinds of writers and poets during their writing carrier.